In its second edition, Oufuqy Music Festival in Alexandria spreads across the city’s downtown geography further. This independent cultural movement is, in fact, taking its first steps to change the way Egyptians lead their lives. The festival, organised by violinist Ayman Asfour, under the umbrella of Gudran Association for Arts and Development, took place between 17 – 23 June and stretched across nine venues: each presenting their own forms of independent arts. The venue expansion was an especially crucial element of the festival to foster collaboration between the independent network of culture spaces in the city and nurture future support and collaboration for the artistic movement in Alexandria as a whole. It is also a statement to testify that these spaces, the artists and their audiences are all part of the same movement and potentially can have a common vision they are working towards in their respective fields. Following the first edition’s successful recipe, the festival featured two live performances each day, along with a film screening related to music and workshops and discussions revolving around music production and art throughout the festival. Oufuqy, meaning horizontal, is designed to stretch over an extended number of days, to allow for the audience to embrace and incorporate the events into their daily lives. Asfour curated the programme to reflect the reality of the independent music scene in both Alexandria and Cairo. While he wanted to have each day or number of days dedicated to a certain musical genre, this would have not been a realistic representation of the scene nor would it have been helping the sustainability of the festival as a whole. In Egypt’s two largest cities – Cairo and Alexandria – the critical discourse is still stuck in the “mainstream” vs. “underground” rhetoric, while neither of those labels actually reflect any meaning on the music itself, but rather on the nature on how this music is produced. “Our movement is still young,” Asfour commented elaborating that his vision for the music industry is to start having genres that classify not only the musicians, but also their audience and the lifestyle they lead. “After a while this can help people develop their consciousness that there this mainstream/underground classification is non-existent, but that you have several musical styles, and the audience of each of these follow their selected styles while respecting and appreciating the others,” he added. Asfour has been working on an ongoing, on-the-ground research on how to develop the independent music scene in Egypt. Oufuqy falls under this extensive project, along with El-Mashtal (The Greenhouse) which nurtures 40 underground bands in El-Cabina’s music studio, offering them a space to practice for a small symbolic fee all year round. “As a researcher, I discovered the first problem in this equation,” Asfour commented on El-Mashtal. “Now we have many bands, who are highly technically developed, but they are missing inspiration from other genres of art like visual arts, painting, theatre, dance, books, poetry, thus they lack awareness to choose a line to play their music in,” he explained. “It’s like riding a really nice car, but not knowing where you’re headed. Should we put vegetables in the trunk? Or should we smuggle drugs? Or let’s go to Baltim or let’s throw it in the Nile and turn it into a boat? Even though you have a great car that you spent money, time and education on,” he said stressing on the importance of the conceptual element of music. Asfour hopes to spend the coming year focusing on delivering real, non-imposed mechanisms to get the musicians exposed to other genres of art, and genres of thought to develop their music. Besides the conceptual development of the artists, Asfour is also concerned with finding alternative ways for these musicians to make money off their art. While many artists and culture spaces depend on grants from non-governmental organisations, embassies or corporations to operate, Asfour and many others on the scene believe that this model is not sustainable. Asfour wants to establish a music label, operating on the basis that independent voices need to remain independent, and should not be stifled by their donors, their labels or any products they are promoting. He has also been concerned with the need to not only develop the musicians on the scene, but also the people who work “behind the scenes” as he puts it. From managers, technicians, photographers, organisers and many other roles that make a music scene possible. Training would be a viable option for this endeavour, and Asfour hopes to achieve the first step of this by having extensive training for the organisers and volunteers of Oufuqy for several months before next year’s edition in June. Operating on a limited budget raised from the small fee that each band pays to rent the music studio throughout the year, the festival had half the budget of the previous year’s edition, in spite of the geographical and duration expansion. While Asfour could not curate the programme in terms of genres as he had initially intended, the choices for the programme had several elements. First of all, driven by the limited budget, the musicians participating had to all play as volunteers. The festival supported the bands coming from Cairo with accommodation and other support, but essentially the musicians who came went to be part of this festival. Another element of programme selection was based on the bands who train under El-Mashtal. Asfour selected the musicians from El-Mashtal who were ready to present their work to an audience such as High Dam, Takaseem, La Vie and Telepoetic who had even participated the previous year in Oufuqy. Oufuqy Volume II featured films from all over the world on music, from the animation film Yellow Submarine by the Beatles, to Lebanese documentary film Hold on My Glamorous by Sherine Abu Shakra to Fela Kuti Music is the Weapon by Steve McQueen on afro beats. The festival also featured a Drum Clinic with Ismail El-Wahsh, a Sound Theory workshop by Hussein Sami, and Oud player and researcher Tarek Abdallah hosted a concert and discussion on Oud and oriental music in Egypt. The live music component of Oufuqy featured a mix of new bands, established musicians experimenting with new formations and more established projects. The first day started off with Youssra El-Hawary on accordion with the rest of the band, and beforehand La Vie, a band formed in 2001 in Alexandria who haven’t been playing for years and just reformed their group this year. 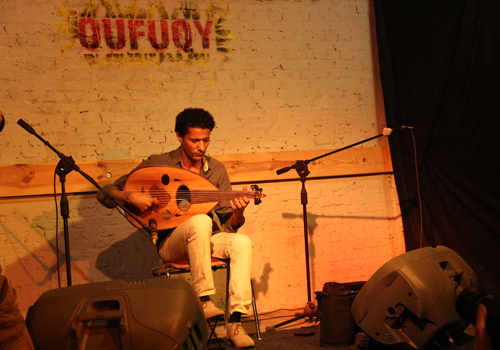 The second day featured Tarek Abdallah, and before him Syrian musician Ramy Sebei in small intimate settings with a limited audience. On Wednesday 19 June, Like Jelly hailed from Cairo to present the first large concert in the programme, leaving audiences laughing and singing along. Keeping with the peak the festival was in, Taqaseem played on the street in front of El-Dokkan one of Gudran’s spaces, and Nubian/electronic 11 member band High Dam played a large concert in the French Institute’s hall turning the concert into a dance frenzy. Newly opened visual arts space Janaklees hosted Maktoob Trio, which features musicians Ayman Mabrouk on percussion, Wael El-Sayid, an accordionist and Oud player Ahmed Maher, followed by an acoustic night with Aya Metwali. On Saturday, Fou’ El-Sefr group presented Hip Hop with neighbourhood children at a local ahwa (café) followed by electronic musicians Telepoetic. The final night of the festival featured a truly unique event; an onstage improvisational session by Amir Elsaffar, Lety El-Naggar and guests. Oufuqy’s second edition proved yet again that an entire festival promoting this ever-growing music scene can take place with a limited budget and volunteer efforts. However, with more detailed planning over a longer period of time, Oufuqy’s third edition can find itself a true model for festivals that promote musicians and provide a channel for audiences hungry for new forms of art while maintaining the integrity of the movement involved as it has in the past two editions.